So speedy for a six year old little guy. You were the best First Communion present, ever. Greetings Balou in Germany, best guinea pig in the whole wide world! 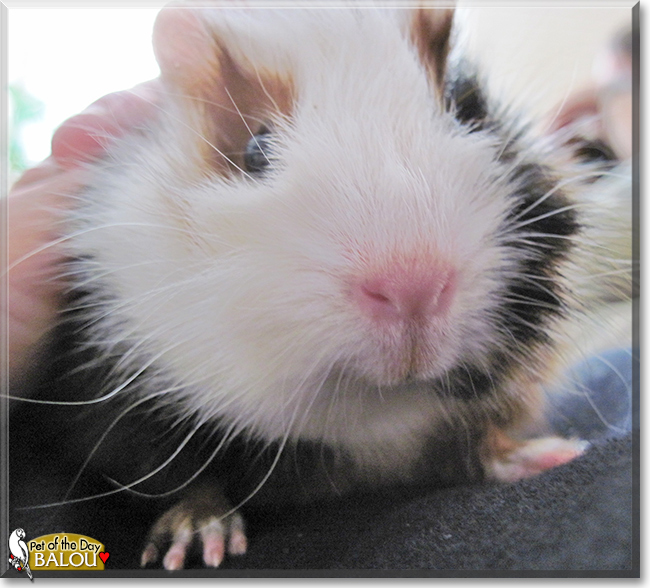 Happy Piggy Pet of the Day to you, sweetheart, and to Peaches too, from all in this wheeker loving home! What a beautiful wheeker boy you are, Balou! Your coat and coloring are gorgeous!!! How lucky your young human is, having a best furry friend as beautiful, as sweet and loving (and fast! ) as you...BEST. GIFT. EVER.!!! You truly are the best of the best, Bablou, a treasure, and so very deserving of your big day of international fame! Thanks for the BIG smiles, sweetheart! Meeting you today has been a real treat! I hope you're enjoying a very special day of celebration...treated to tons of fun floor time, racing with Peaches; munching on yummy treats and cuddling with your human; being loved and pampered to pieces! Lots of love, cuddles and kisses to you, beautiful Balou, our very special and most deserving Pet of the Day, EVERY day! Love to dear Peaches, too! Dearest Balou, what an adorable Guinea Pig you are! You're so cute with that big pink nose and the long white curly whiskers. You were a First Communion gift to your dear person, and you share a cage with Peaches, your person's sister's piggie. You know a good trick, standing up on your hind legs to get a treat. You run faster than Peaches in races! You and your dear person and Peaches and her person all love each other very much, don't you. What a wonderful love-filled home you share! Congratulations, darling Balou, on being chosen today's Pet of the Day! We hope you and Peaches and all your family and friends are enjoying a fine celebration, full of fun and lovies and all your favorite games and treats. Congratulations, Balou, on being POTD! You are precious and adorable! (We cavies/GPs!) We are so glad you have such a great life with Peaches and your loving human family. You don't need to know any "tricks" ~ God made you perfect already! Sending you lots of love and best wishes for a continued happy, healthy, fun, safe life, Sweetie! http://www.guineapigsrfun.net P.S. We hope to meet Peaches as POTD soon! What a beautiful Guinea Pig you are, Balou! Congratulations on being Pet of the Day! Bailout is the cutest and very best POTD!